When management at the University of Sussex announced plans to outsource 235 jobs, workers responded by launching a 'Pop-Up Union', a new tactic in modern British industrial relations. Is this a model other workers can emulate? In May 2012, the management at the University of Sussex announced plans to transfer more than 10% of their workforce to private, outsourced firms. Of the approximately 2,200 staff, 235 were facing privatisation. The affected workers were mainly in catering, estates, and facilities management, including roles such as cleaners, porters, and cafe staff. The majority of affected staff were relatively low paid, although some mid-level management were also due to be outsourced. There are three recognised trade unions at Sussex. UCU is the largest, and represents academics, postgraduate students, and higher-grade support staff (typically managers). Unison and Unite have recognition agreements for various aspects of the support staff, with Unison representing most clerical and cleaning staff, while Unite represent the porters and trades (electricians, plumbers, etc). Most of the affected staff would be in Unison or Unite, with only a handful in UCU. The following week, the three trade unions organised a mass meeting in a campus lecture theatre, Arts A2. The room holds around 300 people, and had been the scene of an eight-day occupation in March 2010, when students defied a high court injunction to demand reinstatement of six students suspended for involvement in a previous occupation. The room was packed, with people spilling into the aisles. The atmosphere was militant and confident. Union branch officials spoke about the unfairness of management announcing the plans without consulting them. A speaker from the floor - a Marxist lecturer - proposed a show of hands as an indicative ballot for industrial action. Every hand in the room was raised. The branch officials cautioned that it could take six weeks to organise official industrial action, but there was no doubt the appetite was there. That week and the following one, demonstrations were organised by rank-and-file affected staff. A facebook group was set up, and posters and flyers appeared all around campus. Accepting defeat from day one? Unfortunately, Unison branch officials began working against the campaign at this early stage. Emails were circulated stressing the demonstrations were not organised by the union, and that it had not been agreed by management. Privately, officials stressed that demonstrations were 'the wrong tactic', too confrontational, and risked losing the (non-existent) goodwill of management to consult with them over the terms of the outsourcing - which was assumed to be going ahead. In fact, while the Unison branch officials were the worst offenders, none of the campus trade unions really put forward a plan to oppose the outsourcing. Unite, to their credit, were the most open that industrial action was needed, but as the smallest of the three unions, they stressed they couldn't do it without UCU and Unison. Unite reasoned - probably correctly - that they didn't have the strength to beat management on their own. Unite members had previously been stitched up by Unison in a dispute several years prior, when Unison failed to ballot for agreed joint action leading to an unsuccessful strike by Unite members alone, with Unison telling their members to cross picket lines. Instead, the attempts to oppose outsourcing, rather than simply attempt to negotiate the terms, were lead by rank-and-file affected staff, supported by student activists and other rank-and-file campus workers. However, these attempts ran out of steam over the summer of 2012. This is a common problem with campus organising, where students are away or working, and campus becomes something of a ghost town. No more trade union meetings materialised, and staff, at this point, lacked the networks and relationships to organise their own. With little in the way of meetings or demonstrations, the campaign stalled. It is worth noting that Unison's approach was not an anomaly of a particularly bad branch (though that it may be). Rather, it was fully in line with the Unison rep training on outsourcing. This, while stating a verbal opposition to outsourcing in principle, emphasises negotiating the terms of the Transfer of Undertakings and Protection of Employees (TUPE) agreement rather than attempting to prevent the outsourcing from happening. Over the summer, a small group of workers and students began meeting informally, and began mapping the campus and building contacts with rank-and-file workers. The idea amongst SolFed members was to get to a point where a mass meeting could be called independently of the campus trade unions, to discuss and organise industrial action. This seemed very ambitious, but the alternative seemed to be accepting defeat before the fight even began. During this time, disillusionment with Unison in particular was growing amongst rank and file staff. many had stories of betrayal, such as Unison working with management to impose changes to contracts that staff had voted to reject, or Unison refusing to ballot with other Unions and instructing its members to cross picket lines. Many of the workplace militants who might usually be reps were disillusioned, not participating in the branch, and on the verge of quitting, possibly to join Unite. As Christmas approached, small 'mass' meetings of 40 or so had been organised. But the numbers were too low to organise industrial action, and even among the militants who attended, support for unofficial, wildcat action was low. 'If only we had the numbers of the early meeting!' was remarked more than once. As the meetings couldn't organise official action, and there wasn't sufficient appetite for unofficial action, attendance began to dwindle, and the attempt to kickstart the opposition to outsourcing floundered. In response to these meetings, Unison organised a meeting advertised as a discussion of action against privatisation. It was well attended - only to discover the aim was in fact to fill out a survey on methods to increase productivity. The branch officials planned to present this to management to persuade them to talk to them. Several SolFed/Education Workers Network members accidentally led a walkout when they left to get lunch, and several more people took the opportunity to walk out in disgust. Those who remained staged a minor rebellion, demanding a ballot for industrial action. Branch officials promised to discuss it at the next meeting - then simply didn't organise another meeting for several months. Around this time three related ideas began to circulate, which would later coalesce into the Pop-Up Union. As mentioned, many Unison members were on the verge of quitting to join Unite. Ironically, the creation of the Pop-Up Union probably delayed or even prevented a mass exodus, since it was expressly set up to allow dual membership. Unison officials never really appreciated that. Some staff were also discussing joining an independent union, such as the IWW or IWGB, who had had some success organising cleaners at several London university campuses. A third idea came from a discussion of Joe Burns' book 'Reviving the strike'. Burns, writing in a US context, proposes that unions set up formally independent front organisations to organise what would otherwise be unlawful strike action without risking the union's assets. However, in the US, the right to strike is a right that individual workers have, which is signed away by a union contract. This is why Burns suggests unions set up formally independent non-union groups as a vehicle for strike action. However in the UK, there is no right to strike (though recent precedents in the European Court of Human Rights may be changing this). Rather, only trade unions have some limited immunity for breaches of contract (e.g. striking) and civil torts (e.g. lost revenue). Burns' idea was turned around therefore, to propose a temporary, single-issue 'anti-privatisation union', which, having the legal status of a trade union, would be able to organise official industrial action. These three ideas circulated, and began to fuse into the idea of a 'Pop-Up Union', a temporary, low-dues, trade union with the sole purpose of organising industrial action to defeat outsourcing. Then in February 2013, following a large demonstration organised by students and some affected staff, several hundred people took over the Bramber House conference centre and Occupy Sussex was born. Management initially brought in private security and attempted to impose a siege on the occupation (clearly, management didn't trust the loyalty of in-house security staff, themselves facing outsourcing). However, after a few days of winching in supplies via a balcony, another mass demonstration rushed the doors, overwhelmed the bouncers, and secured open access. Bramber House, one of the facilities slated for outsourcing, became a valuable organising space and hub for campaign activity, as well as hosting discussions, film screenings, exhibitions, music and poetry events. The bold action by the students also inspired many workers, many of whom had become disillusioned following nine long months of trade union inaction. Workers began to meet with each other and with students, and formed a working group which would lay the groundwork for the Pop-Up Union. Activity intensified: legal research was done, organisers had one-on-one conversations to float the idea to rank-and-file workers and union reps, and funds were secured to list the Pop-Up Union with the Certification Officer (which provides evidence of being a 'real' trade union). Unison's response, after months of silence, was to send a letter to all members warning them off the Pop-Up. The letter included false information - it's hard to know whether deliberately dishonest or just ill-informed - such as citing the British Airways v Unite case on balloting technicalities, which had already been overturned by a newer precedent in a higher court (see legalities box). This was Unison's first official communication with members about the outsourcing, and all it said was stop doing what you're doing and get everyone to join Unison! 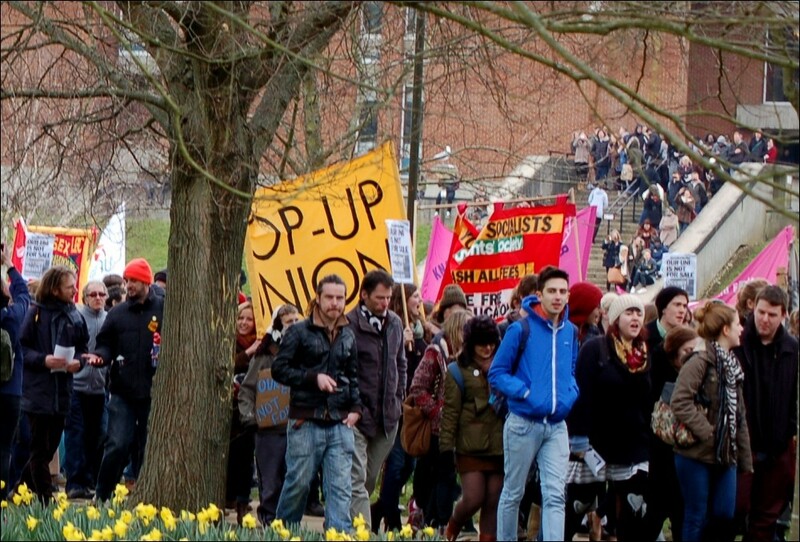 After six weeks of intense organising, the Pop-Up Union was publicly launched at a national demonstration called by Occupy Sussex on the university's Falmer campus on March 25, 2013. With momentum building, it was hoped that membership would snowball to a sufficient level to allow for disruptive industrial action. The formal legal process for official action was initiated, with the Pop-Up Union delivering a 3,000 word claim document to management listing grievances and demanding a response. A crowd-sourced strike fund was launched which raised several thousand pounds and substantial further pledges if the action went ahead (this money has since been earmarked to support non-union strikers in the official pay dispute). At the same time, Unison full-timers arrived on campus, and started slandering the Pop-Up as a scab union on the campaign facebook group (comparing it to the strike-breaking Union of Democratic Miners in the Miners Strike of 1984-85). Who exactly the Pop-Up were scabbing on, when Unison refused to organise industrial action, was not explained. This disinformation and slander backfired, since it was their own members and activists they were attacking. Ironically, the full-timers' hostility to rank-and-file initiative alienated many of those who had been arguing for working within the Unison branch. The Pop-Up was formed as a 'listed' trade union, appearing on the official list maintained by the Certification Officer. It was set up as an industrial union - open to all staff on campus except senior management. The union rule book was compiled from elements of the Industrial Workers of the World (IWW) rulebook - which had already passed the Certification Officer's scrutiny - the SolFed industrial strategy, which stressed worker-control through mass meetings and recallable delegates - plus some modifications to include necessary legal requirements and specifics about the Pop-Up Union's nature and purpose. Dues were set at 50p to encourage non-union staff to give it a try, and to allow existing union members to participate without having to quit their existing union, if they didn't want to. The Pop-Up was explicitly temporary and single-issue (anti-outsourcing). As the Pop-Up Union was formed to operate within the law, the launch began a race against time to organise industrial action before the summer break - when it would be far less disruptive. All this time, workers in Unison, Unite and UCU had been pushing within their branches for industrial action. Unite's position was in favour of a ballot, but only if Unison balloted too. With only a handful of UCU members affected the branch was also told by the national union they could only ballot if Unison did. Unison officials stalled, lied and deflected all requests for a ballot - even when it was formally proposed and passed by a show of hands at union meetings. Indicative ballots - at last! After ten months of brick walls, within a week of the launch of the Pop-Up Union, all three campus trade unions announced indicative ballots on industrial action. While these have no legal status, they are commonly insisted upon by union hierarchies before authorising an official ballot. Unison soon sent a second letter to members, announcing they had entered formal dispute with management. The wording and claims within their dispute were remarkably similar to the Pop-Up's claim document, which had been shared with the Unison branch as a courtesy. Of course, Unison officials insisted this similarity, as well as the timing, was purely a coincidence. The indicative ballots came back strong: UCU 70% (60% turnout) and Unite 93% in favour (70% turnout). However, Unison's result was more ambiguous, due to an impressive level of self-sabotage. First, Unison officials downplayed their membership numbers, saying they feared derecognition as membership had fallen so low, and they couldn't ballot for industrial action without major recruitment. Then, they agreed to organise an indicative ballot, following the launch of the Pop-Up. Subsequently, they backtracked on this commitment, made with the other recognised unions, and instead circulated a four page survey packed with inane questions such as how frequently members wished to receive emails from the branch. Branch officials decided they had a "communication problem", and if only members knew all the fine work they were doing behind the scenes, a strike and a Pop-Up Union would be unnecessary. Questions on industrial action were buried on pages 2 and 4 of the survey, which was subsequently referred to as a "prize draw competition" rather than an indicative ballot. The results were then delayed for two weeks, allegedly for counting (UCU and Unite had used an online poll, which compiled results instantaneously). Despite all this foot-dragging, the results were pretty strongly in favour of industrial action. Unison activists, not trusting branch officials, had hand delivered the 'surveys' to members and told them they only needed to complete the questions on industrial action. When the results were collated, branch officials announced that the turnout was lower than the number of forms hand-collected by several activists. They also started claiming a membership of double what they had previously claimed - when possible derecognition was the reason for inaction - which had the effect of halving the alleged turnout. Despite repeated requests within the branch, the turnout was never clarified, but the result was 85% in favour (with a turnout somewhere between 30% and 60%). While Unison officials desperately sabotaged and downgraded their own indicative ballot, the Pop-Up forged ahead. The target date for industrial action was June 2013, which gave a timescale of six weeks to meet all the legal notification requirements. This was the quickest a TUC union could ballot, with a full-time legal team involved. The all-volunteer Pop-Up went into overdrive to try and make the schedule. There was no margin for error. Unfortunately two errors were made, one of which management discovered. One of the requirements for official industrial action was to give management a 'matrix' of affected staff. The Pop-Up had been advised that this was all the staff eligible to strike. However, management's expensive London lawyers served a High Court injunction insisting the matrix needed to detail union membership numbers at the time of balloting. On further investigation, it seemed likely they were right. The Pop-Up - formed to organise industrial action within the law - was forced to cancel the ballot. The planned strike never materialised. The injunction killed off the threatened Pop-Up strike. But the fact management relied on a small technicality validated the concept. If Pinsent Mason LLP - with a specialist team in industrial relations law - could only find a technicality to base an injunction on, then the principle is sound. Future attempts would simply have to not make the same mistake again. The balloting process is - quite deliberately - a minefield, but it is not impossible to navigate. The fact management's lawyers packed their injunction with irrelevant hearsay - such as property damage unrelated to the Pop-Up - was a clear sign their whole case relied on that one simple error. An error easily avoided in future. Up until that point, membership had been swelling. The Pop-Up became the second largest union on campus, and involved many staff who'd never previously been in a union before. Many staff with long time union experience said it was something really different - 'this is how a union should be' was a sentiment expressed more than once in relation to its direct democracy. While the form of the Pop-Up union was inspired by the assembly-based horizontalism of Occupy Sussex, as well as anarcho-syndicalist ideas about self-managed unions without hierarchy, it was not, as some critics alleged, a 'red' or revolutionary union. Indeed, the objective of the union was rather more modest than the overthrow of capitalism and the state - maintenance of the status quo by resisting outsourcing. It addition, its methods, while directly democratic, were explicitly legalistic, rather than the wildcat, direct action favoured by revolutionary unionists. 'Self-organised legalism' would probably be a fairer description, with all the contradictions that implies. True, if successful, this may have laid the groundwork for future struggles, and perhaps a more permanent autonomous union (this was a conversation deferred until the fight was won). But the politics of the Pop-Up were far from revolutionary. Opposition to outsourcing is the kind of thing that, were not the existing unions so compromised by social partnership and bureaucratic inertia, would be bread and butter trade unionism. Ironically, when Unison officials claimed it was "illegal" to strike against outsourcing, Pop-Up activists found a legal precedent - won by Unison - that outsourcing was grounds for a lawful trade dispute. Following the Pop-Up's attempted strike, management did improve their voluntary redundancy offers to many of the 235 affected staff. It would be dishonest to claim this as a victory, but it was a concession. And while Unison claimed it as the fruit of responsible partnership and union recognition, many staff, who had been made to sign gagging orders, chalked it up to the actions of the Pop-Up, which had been a game-changer for management and the recognised unions alike. While the Pop-Up was defeated, it may yet rise again to take on new struggles. And it has planted a syndicalist seed which has been noticed far beyond the Sussex campus. At the same time, the experience highlights how industrial action within the law is industrial action according to the minefield of rules written by and for the bosses. Legalism remains such a minefield even if the union bureaucrats can be bypassed. Navigating this minefield is not impossible, but is a major handicap for workers in struggle. A Trade Union, in England and Wales, is any organisation which meets the definition set out at the start of the Trade Union and Labour Relations (Consolidation) Act 1992 ('TULRCA'). The full text is available online, and wikipedia has a summary. Trade unions have certain 'statutory immunities' for inducing breaches of contract (i.e. employment contracts - organising strikes). They also have legal obligations set out in TULRCA, such as obligations to maintain membership records, hold elections, and file audited accounts. Although any organisation that meets the legal definition is a trade union, 'listing' with the Certification Officer is good evidence the organisation is indeed a 'real' trade union. Listing costs £150. The Pop-Up did this, and the status of the Pop-Up was not disputed by the injunction (management simply noted they did not recognise the Pop-Up, which was irrelevant). Trade unions need to have a rulebook, which sets out how they operate, and includes certain legal obligations and phrases. The Pop-Up Union's rulebook was based on the IWW's one combined with SolFed's industrial strategy, with some modifications and legal phrases added to satisfy the Certification Officer. The Department for Business, Innovation and Skills (BIS) 'Code of Practice' on industrial action also relates to trade union law. The contents - including the infamous '6 person per picket' limit - are not law. However, they can be used in court as evidence of 'reasonableness', so if involved in official action it can be wise to follow the code closely so long as it doesn't compromise the union. The process for organising official industrial action is set out in TULRCA and elaborated in the BIS Code of Practice. This includes having a 'trade dispute' and going through a number of steps to notify the employer of the dispute, the intention to ballot, and details of the ballot. The quickest possible process is commonly reckoned to be six weeks. Recent case law has overturned the famous British Airways v Unite precedent, where small inconsequential errors can invalidate a ballot. Now, according to the precedents in RMT v Serco Ltd and Aslef v London & Birmingham Railway Ltd (Court of Appeal, 2011), the 'de minimis' rule applies. In other words, errors must be consequential and substantial. The law that covers workers being outsourced is the Transfer of Undertakings (Protection of Employees) Regulations, better known as TUPE. In theory (according to direct.gov.uk), the law means: your job transfers over to the new company; employment terms and conditions transfer; continuity of employment is maintained. However, there’s a catch – and it's a big one. The above only applies to changes arising from the transfer itself, and not from “an economic, technical or organisational reason” (section 7(1)(b)), which covers pretty much anything a new employer might dream up. TUPE also does not cover pensions (section 10). Common tricks employers use to get around TUPE include: offering redundancy to existing staff, or 'managing them out', and bringing in replacements on worse terms and conditions (with a slightly different job title); creating a two-tier workforce with all new hires on inferior terms and conditions; and carrying out a business restructuring, activating the 'organisational reason' clause. Consequently, TUPE offers even less protection than it appears to on paper. Unfortunately, many trade unions focus their approach to outsourcing on TUPE negotiations - particularly union recognition status - rather than opposing outsourcing per se. This focus is reflected in union training courses for reps that deal with outsourcing, and means that often employers can outsource staff more or less unopposed. Is the Pop-Up Union a model for workers elsewhere? It isn't a one-sized-fits-all model, but it does have some advantages. There are pros and cons to the model, which will influence whether it's the right tactic in the circumstances. Below, the strengths and weaknesses, as it played out at Sussex, are listed and discussed. Industrial not trade: The Pop-Up Union was open to all workers on campus (apart from senior management). This helped overcome the division of staff between different recognised unions, and simplified the legal process for joint industrial action. Trade divisions are an artificially divisive way to organise, and industrial unionism helps overcome this. Horizontal/directly democratic: The Pop-Up had only the officials required by law, and these had no power, and were subject to mandates and recall. Decision-making power rested in open members' meetings. The Pop-Up Union was a workers association without representation - nobody spoke for the workers, workers spoke for themselves. Can organise lawful, official industrial action: This was the main purpose of the Pop-Up Union, to create a minimal legal form which gave the open workers' meetings the power to enter a trade dispute with management and ballot for official industrial action. Moved the TUC unions: Within a week of its launch the Pop-Up Union had more success getting an indicative ballot out of the three recognised unions than ten months of patient pressure by members within their respective branches. Fear of being outflanked seemed to break the inertia. Low dues/dual card: At 50p dues, anyone could afford to join, even if they were already paying subs to an existing union. This minimised conflict with the existing trade unions, and also took away the 'I can't afford it' excuse, encouraging some workers to unionise for the first time. "This is what a union should be! ": Many Pop-Up participants said things to this effect. The experience of direct democracy showed another way to do union organising, and gave an organisational form which helped sustain and link up the self-organisation of different groups of campus workers. Temporary: The Pop-Up Union was temporary by design, but this limited the potential for longer-term gains or organisation. But contacts, trust, and mutual respect was built between campus workers, and the Pop-Up may yet rise again if needed. Small and resource-poor: The low dues policy meant the Pop-Up was run on a shoe-string. Virtually the entire subs revenue was spent on stamps, envelopes and printing for the postal ballot. However, an innovative crowd-sourced strike fund was deployed, a tactic subsequently used to great effect by the IWGB cleaners strike at the University of London in November 2013. Legalistic: The Pop-Up was legalistic by design, but this did mean it had to navigate the minefield of the UK's repressive anti-strike laws. Legalism means fighting on the bosses' turf. This could even have encouraged workers to believe in legalistic methods, which ultimately allowed the strike to be squashed by an injunction, rather than direct action. Reliance on experts: Arguably legalism also created a reliance on the few relative legal 'experts'. They had expensive lawyers where we had cleaners, porters and receptionists trying to get up to speed, with many members relying on a few. At several points, things were delayed by waiting to contact external legal experts for help. This was in tension with horizontalism. Race against time: An ordinary drive to organise a new union would pick small, winnable fights to build up confidence and membership on a timescale set by the union. At Sussex, the Pop-Up took on a huge fight affecting several hundred staff, from scratch, on a timescale set by the bosses. This meant it was always a race against time, especially as the Pop-Up wasn't even launched until it became clear the recognised trade unions were not going to allow a strike. Ultimately, the Pop-Up Union was a contradictory mix of self-organisation and legalism. These tendencies pulled in opposite directions, but for a single-issue, temporary organisation, that wasn't a big problem. While the Pop-Up was hit with an injunction, the principle is sound, and could be repeated by workers elsewhere more easily, now that a precedent, and the trial and error that went with it, has been established. Pop-Up Unions - or even just the threat of one - could be useful to groups of workers divided between several unions in one workplace, and/or where their recognised unions are refusing to hold a ballot. The limit of the Pop-Up is the limit of working within the UK's highly restrictive anti-strike laws. These are difficult, but not impossible, to navigate. Wildcat, unofficial action might be more effective, but where the confidence or organisation required to pull that off doesn't exist, Pop-Up Unions may be a viable tactic somewhere in between the bureaucratic, representative legalism of the TUC unions and wildcat, unofficial action organised through workplace mass meetings. Where next for the anti-outsourcing campaign at the University of Sussex? Pop-Up Unions - or even just the threat of one - could be useful to groups of workers divided between several unions in one workplace, and/or where their recognised unions are refusing to hold a ballot. Brilliant stuff, I have been wanting to read an account of what happened with this for over a year! It's a shame about the injunction, but yes I agree this is something workers can use in the future. Certainly if ever I want a ballot at my work again and the union national officials won't give us it I will advocate us doing this instead. TUPE struggles are difficult. I've been personally involved in a couple. One where I was the lead union rep (or at least, I became it three quarters of the way through the dispute). Unfortunately there was no appetite for industrial action against the outsourcing. And most people just wanted to take redundancy, then apply for new, lower paid jobs in the new organisation (the advice from union national officials was that probably this would be workers' best bet, as TUPE protections are so weak they could just reduce people's pay anyway shortly after they transferred, without paying out any redundancy). We managed to get some enhanced redundancy, and more money for the new service, but that was it. Glad you enjoyed it in any case! You probably won't believe this, but I read this as a UNISON official and I found it really interesting and it really made me want to learn from the very clear mistakes. I think there are lots of conflicting and competing forces - such as many branch officials being reliant on the employer giving full time release and many see themselves as part of the machinery. I work in a totally different region and so I don't know any other side of the story, but I'm really impressed by the ingenuity and courage of workers in this dispute. Thanks for such a detailed and considered account - am going to share it with colleagues, if that's ok? I don't doubt you sincerity Penski - but business unions like Unison, Unite, UCATT, GMB, etc are the embodiment with what is wrong with vertical, reformist unions. I say this as friendly as I can and certainly would like to continue hearing your views. Penski, just to say that it's already a public documents and, although I didn't write it, I'm sure the authors would be more than happy for you to show it around. I can't find a current fees schedule on the new site. but yes please do share it that's what everything on this website is for! Anyone know what happened to the workers and the TUC unions after the pop up union folded? How well attended were the open members' meetings of the pop up union? Was there organised intervention in those meetings by "political groups" other than solidarity federation? What comparisons can be made with the IWGB branch at the University of London who organised a permanent union?